"When You Change Your Brain Waves, You Transform Your Life". The brain is the front door yourself to make changes. The brain determines how you think, feel, and behave. Brain affect how you respond to the recent past, addressing that you will live, and shape your future. 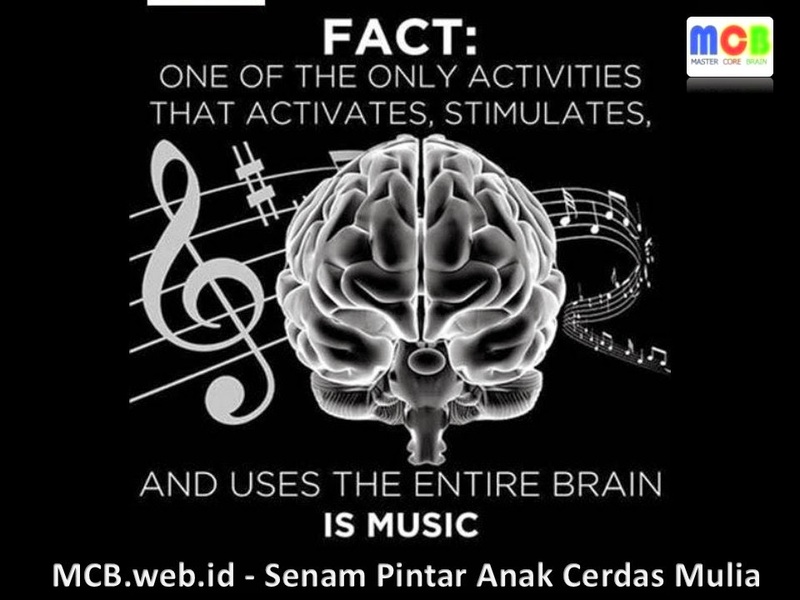 With Brain Wave Therapy (Brainwave) allows the balance of the brain and opens the door changes, even these changes can you feel the first time you listen to this music Brain Wave Therapy. Brain Waves condition yourself will determine your thoughts and behavior. Concentration, pressure, energy, mood, habits, behavior, reactions, and others is a reflection of the condition of your brain wave frequencies. 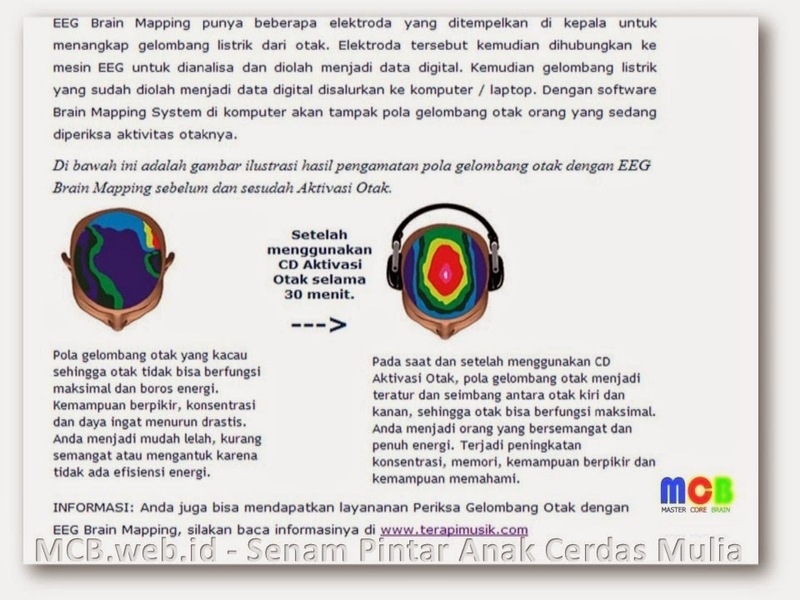 By changing the frequency of brain waves (Brainwave), transformed condition. How Brain Wave Therapy Work? Brain Wave Therapy works by train / stimulate your brain waves in order to get in on a particular frequency range. Every activity we always have continuity with our brain wave frequencies. And with the discovery of an EEG machine (electroencephalogram) it can be mapped frequencies associated with the physiological and psychological human condition. Human brain tissue produces electrical waves that fluctuate. These pulses are called brainwave or brain waves. In 1929, Hans Berger, a German psychiatrist, found Electro Encephalograph (EEG) which can be used to measure electrical waves produced by the brain. Since then the technology based on brain waves (Brainwave) to enhance the ability of the mind and the development of human beings began to grow rapidly throughout the world. Research over the years shows that the brain waves (Brainwave) not only shows the state of mind and body, but can also be stimulated to change a person's mental condition. By conditioning the brain to produce or reduce certain kinds of brain wave frequencies, it is possible to produce a variety of mental and emotional state. Broadly speaking, the human brain produces four types of brain waves (Brainwave) simultaneously, namely Beta, Alpha, Tetha, Delta. However, there is always a dominant types of brain waves, which indicates brain activity at the time. For example if we fall asleep, the brain waves are the dominant Delta. Brain waves can be manipulated (programmed) by listening to the sound that has been set frequency to obtain certain effects as needed. Eg for meditation, what is needed is that the conditions relaksaksi (like sleep) but the mind or consciousness still work. It is certainly difficult for human beings in general, and the meditator (meditation fans) need to practice many years to achieve such conditions. But with the help of a CD that has been specifically programmed this, one can enter a meditative state within a few days of training alone. 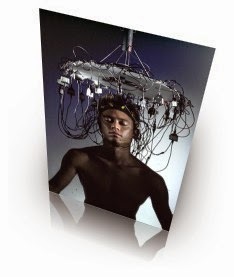 Meditators have used the technology of brain waves (Brainwave) is to enter the subconscious mind in a fast time. Meanwhile Klinik Bad Sulza, Thuringen, Germany, combine the water with music therapy. The program offered the clinic was called liquid sound. For that supplied two swimming pools each measuring 24 m2. With both hands crossed behind, body program participants who are members of a group is floating on the surface of the pool water on their backs. Their bodies can float like in the Dead Sea because it contains salt water pool 3%. In such a position, their ears are submerged in the water could be heard clearly the music that is playing. "The sound of music came in through the skull!" Said Micky Reeman (46), manager of the liquid sound. "As in the mother's womb!" Comments Rose (42), a participant who has a problem with his back. His music is diverse, there is Japanese music, soft music, or pop oldies. Sometimes also played cello musician Matthias von game Hintzenstern. Anyway, like a live concert in the water. Each group may choose the music you love. The music was playing through several loudspeakers mounted on bottom of the pool and spread music to the entire pool. The participants were silent, voiceless! These conditions make not feel it had been two hours they were in the pool. After getting out of the pool, they were admitted to the body and head feels light. Satisfaction looks on their faces. A combination of water, warmth, music, and light can give peace has been known since the time of the New Age Movement in California, USA. In Germany, Mickey Reeman develop and patent the idea of ​​healing water with liquid names sound. At Expo 2000, he appeared with the project. The prototype in the form of a large soaking tub in the basement, which is equipped with a lighted dome and loudspeakers in the bottom of the pool. Many people are now doing water therapy. If you want, also can. No need to look far. You can do it yourself. How, shower or flush the body with warm water. Then soak in cold water temperature 18oC. In this way the body will be trained in a variety of disease. If you experience muscle tension, doing therapy with warm water bath temperature of 37 ° C. Besides soaking feet in warm water temperature 37 - 39oC can to treat the symptoms of sleep deprivation and infections. While the bath with hot and cold stimuli turn will stabilize the work of the heart and blood flow. An effective new method to increase the "achievement" at the school. Your child's intelligence is the future asset for the rest of his life. 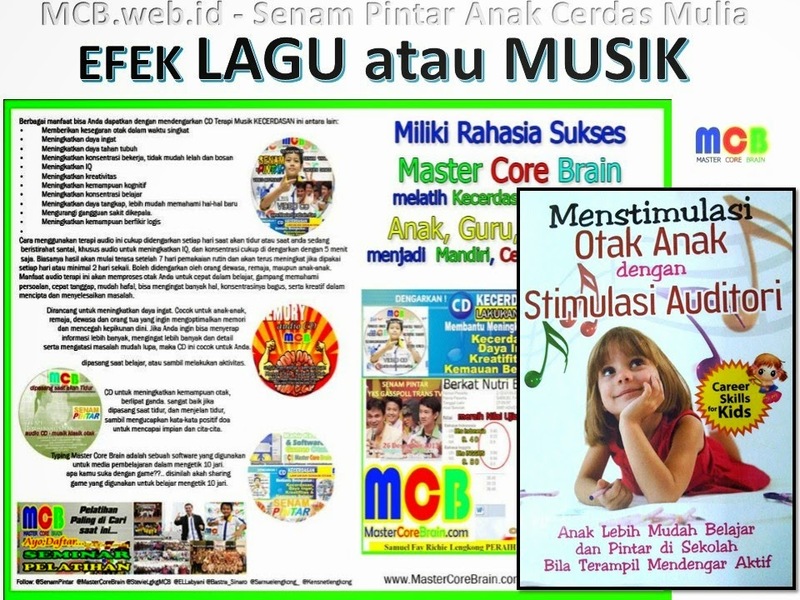 If you are dizzy by your child's learning achievements are declining, discover the magic through CD INTELLIGENCE CHILD. Feel the sensation of freshness incredible brain. 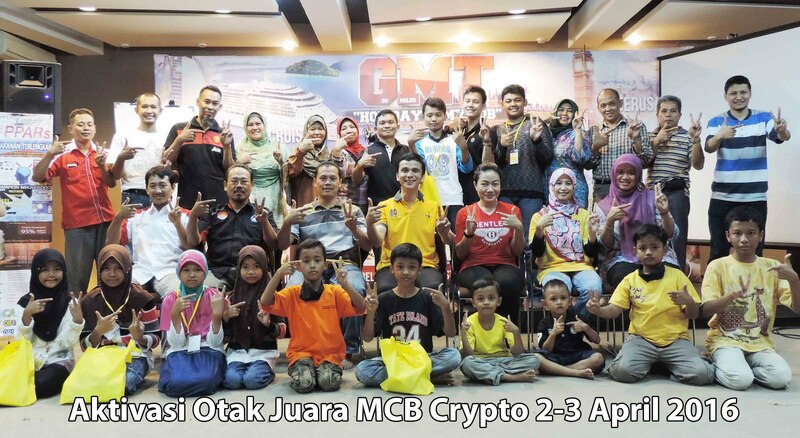 Overcoming Learning Difficulties, Enable Concentration and Improve Memory and Brain Function Balancing your child and you as a parent ..
positive effect if often listen to. Reducing the head pain disorder. How to use this audio therapy enough to be heard every day when going to bed or when you are resting relaxed, specifically audio to improve IQ, and in sufficient concentration to listen to 5 minutes. Usually the results will begin to be felt after 7 days of regular use and will continue to increase if it is used every day or at least 2 days. May be heard by adults, adolescents, and children. 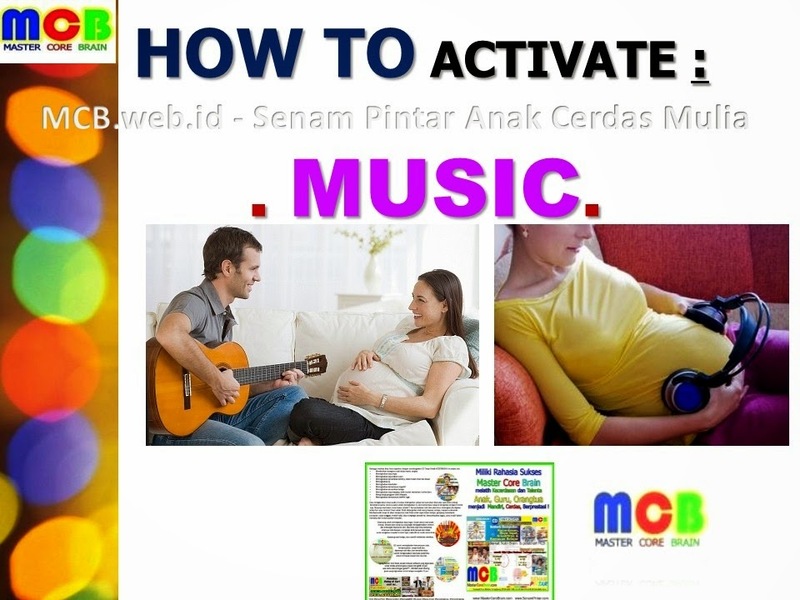 Audio benefits of this therapy will process your brain to faster learning, easy to understand the problem, responsive, easy to memorize, can remember a lot of things, good concentration, as well as creative in creating and solving problems. 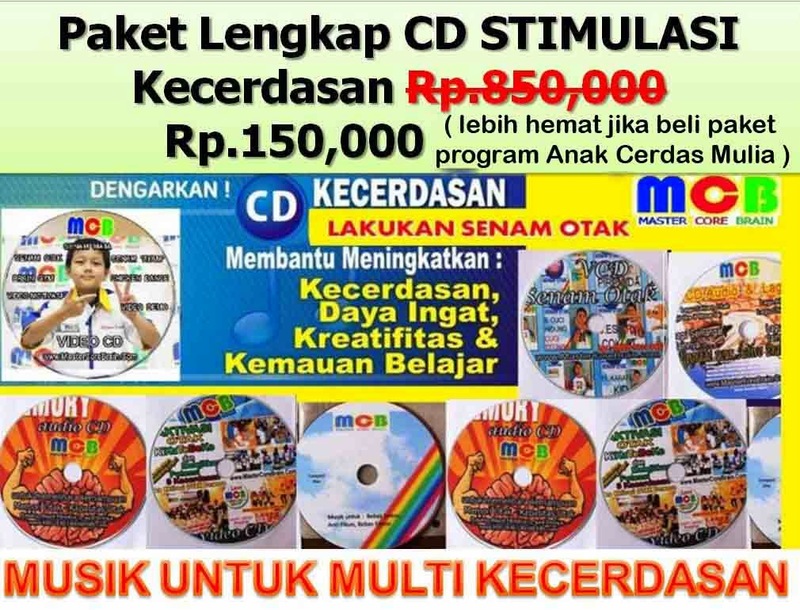 We are a training provider activation of the intelligence of children with eyes closed methods that have spawned thousands of intelligent children in Indonesia, and the CD you'll get is a CD for maintanance for your child to always get the smart brain wave conditions to fill the day-to-day activity in school. 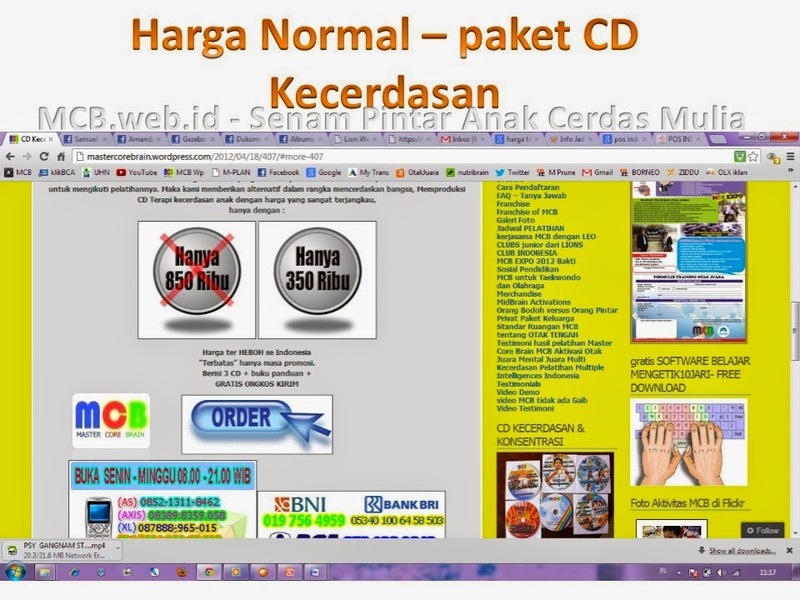 Perhaps you wonder, whether effective only listen to his CD without following the training? We said yes, because the stimulation essence of intelligence is in this CD. The difference, through training, your child will be given an understanding of affection to parents, teachers, and fellow human beings. If your goal to educate your children, this CD is the answer. Although the CD is designed to educate school-age children, parents and teens will also feel the increasing sharpness of memory and thinking if often listen to.